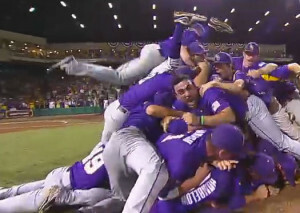 The LSU Tigers became the first team to qualify for the 2013 College World Series by being Oklahoma 11-1 and winning the Baton Rouge Super Regional best of three series 2-0. LSU is making their first College World Series appearance since 2009 when they won the championship. Oklahoma scored first in the first inning on a base hit by Max White to score Craig Aiken. LSU used four pitchers to hold Oklahoma to just five hits, while LSU pounded Sooner pitching for 16 hits. LSU scored single runs in the second, third, fourth, sixth, and eighth innings. The Tigers then exploded for six more runs in the top of the ninth to essentially put the game out of reach for the Sooners and and gain a berth to the College World Series in Omaha, Nebraska. Oklahoma finished the season with a 43-21 record.